Very large amounts of Saharan dust are being advected with southerly winds across the Mediterranean far into central and northern Europe over the next several days. The event is caused by the large and deep cutoff upper low that is affecting SW Europe at the moment. Warm airmass from northern Africa is being advected north by strong Scirocco winds. The dust will be making its way across the Mediterranean and central Europe as far north as Scandinavia. Significant amounts of Saharan dust are already present over western Europe, as the cutoff low has already been affecting the area for several days. 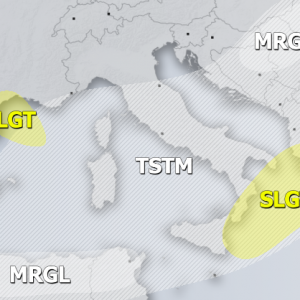 A particularly impressive and dense plume of Saharan dust will be making its way across Tunisia and the Tyrrhenian sea, across Italy and into the Alpine region. By tomorrow morning, the plume will reach far into Germany and Benelux, as well as into the British Isles. By late afternoon and evening tomorrow, the plume will reach as far north as southern Scandinavia and will also have moved eastwards into Poland, Czech Republic, Austria, Hungary, Slovenia, Croatia and Bosnia and Herzegovina. Keep an eye out for the dust accumulating on surfaces such as roofs and cars. In areas of snowfall, keep an eye out for yellowish snow. Dust load over the Mediterranean region over the next 78 hours. Model: University of Athens – SKIRON.